I’m tired. I had cramps in the night. When I rise at 6:45 to go to the loo Cornelia says “Good Morning!” – so I’m up. We drive to Kilkenny and I have a look around while she attends to some business. The camping store in town stocks the tent I’m thinking of buying. It’s been well-reviewed by Tom’s Bike Trip and I can get it on-line for € 140 – which I’d call a decent mid-level price. In the shop it looks fine, but is rather more expensive, I’ll order it later today. I’ve been to Ireland twice before. Once, I came from the Continent and, once, from the States. On both of those visits I was immediately struck by the IRISHness of the place. But now it feels a lot like Wales. Similar architecture, landscapes, the way the roads are laid out. Kilkenny is … a bit whatever. Just a town with a castle – at least on a Monday. 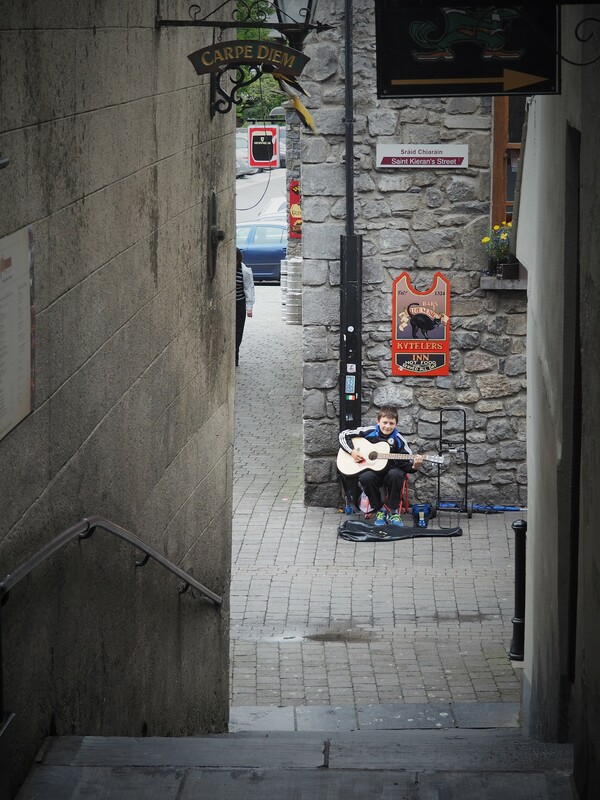 There is a 13-year-old boy busking – playing acoustic guitar and singing Dirty Old Town. He sings it well and charmingly. I need some rest. That seems clear. My tired is a deep tired and it’s taking some of the excitement out of new places. I spent the afternoon and evening bookkeeping. Wow – the UK was expensive. Three crappy coffees – for me, Antoine and Isabella – were AUD $20. It has me thinking of skipping over the UK on my return – Rosslare to France? And, maybe later, visiting London – look for a cheap flight. Or getting a cheap flight from here and just going for a few days to see people and whatever. Cornelia works for the Kilkenny Arts Festival and is encouraging me to volunteer. I think I will. One of my rules for this trip is to say “Yes” when I’m asked to do something or am invited somewhere (if I can do whatever it is and it’s not actually dangerous). But I’ve got to look at my plan – well, make a plan first. It’s warmer in Sydney than here right now – by the way.